WELLNESS JOURNEY – Penn Manor Wins with Wellness! | Wellness information for all PMSD employees! Wellness information for all PMSD employees! During the 2014-15 school year, Penn Manor staff is asked to make one change at a time that enhances mental well-being (Example: Exercise, family time, brain breaks, time management, stress management, journaling, social time, life style changes, clean eating, 5 fruits and vegetables/day, less sugar, etc.). For every five days a staff member sticks with the change, one entry will be earned into a raffle for one of several $25 gift cards. There will be four rounds during the school year. The first round will begin 9/25 and run through 11/25. A maximum of 12 entries is possible as it is a 60 day span with only one change being made and five days/1 entry. Optional calendars may be used to help guide employees. Additionally, staff members are asked to write “kudos” to their colleagues. These will be used to RALLY staff mental well-being. “Rally by Roadhouse” entries will be bonus entries into the $25 gift card drawing. For every 5 “rallying kudos” statements written, an employee will earn a bonus entry into the drawing (maximum of 3 bonus entries). Texas Roadhouse has graciously sponsored this program by providing $15 gift cards. Staff members who receive “rallying kudos” may be selected to win the $15 gift cards. Buildings will be provided gift cards for those persons and wellness committee members will help their buildings run the “Rally by Roadhouse” program. Utilize stress relieving activities and maintain an optimistic attitude. Increase your water intake and be mindful of other beverages. Put some exercise into your day. You may “dress down” if: you made a conscious effort to partake in at least one of the changes for the week AND you somehow pass the message along to the students about the importance of wellness. Money is not the point of the day/week. It’s a reminder from the administration about how valuable staff is and to take care of one’s self. If you have a “Make One Change” T-shirt, please wear it. If you do not, please feel free to wear any appropriate, Wellness-themed shirt (as long as you meet the preceding two criteria). Please find the pledgesheet here! Grace Cancer Cares – Cancer Myth Buster Session! Grace Cancer Cares is offering a 1 hour Cancer Myth Buster session with Jean Kozachuk this Thursday. Jean will lead us in an informative session on cancer diagnosis, various stages and treatment overview. Jean has worked 25+ years as a professional in oncology and can provide answers to many questions when caring for someone with cancer. Her experiences and her energetic personality will definitely provide encouragement and understanding. Feel free to bring a friend or family member along. Child care provided. November 21, 2013 is the 2nd free Learn to Knit a Prayer Shawl! Earn entries into a drawing for multiple $25 gift cards! Just make one positive wellness change and for every five days you stick with that change, you earn 1 entry into the drawing (does not have to be 5 consecutive days). This program starts on 9/26 and ends on 11/26 (Report number of entries to your wellness building rep). Next round starts 11/27 and runs for 2 months, etc.…this program will run the entire school year!!! 60 days during first round, so maximum of 12 entries! When your change becomes a habit, pick a new change! The theme of Opening Day for the 2013-14 school year is “Make One Change”. Employees are encouraged to make one small wellness change until it becomes a habit. By taking care of our self first, we can then be more successful in helping others. The Wellness Committee will be working hard to provide initiatives to carry this theme through out the year. Automatic Notifications for the Wellness Blog are only sent when new posts are added to the website. Most of the updates and changes I make are to pages, therefore, you wouldn’t get an automatic notification with every change I make. This is good because I doubt you would want a notification about every change; however, please be aware the blog is constantly being updated and should contain and be a good resource for up to date information. Note your weight on your own confidential card. Indicate on the sign in sheet at the scale whether your goal was met and if necessary, $1.00 paid if goal not met. IF weigh-in was missed, $1.00 for each week missed (ex: forgot to weigh in one week = $1.00). Dawn Janssen continues to weigh in weekly and notes it on the chart in the nurse’s office. 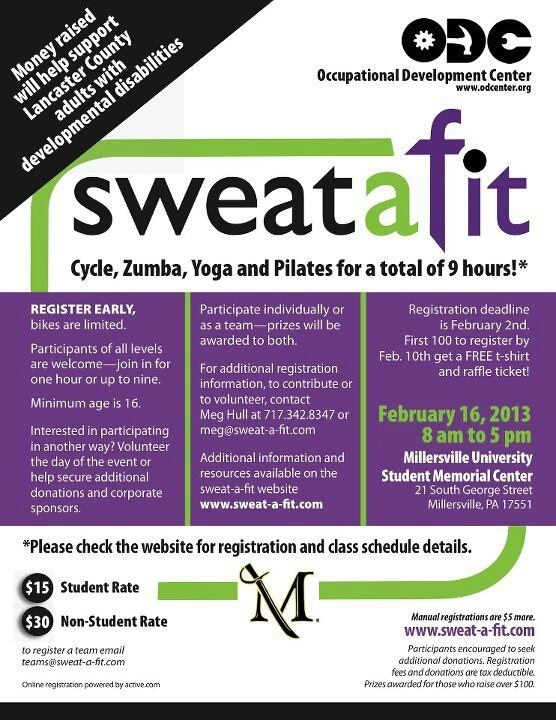 Cycle, Zumba, Yoga, and Pilates for up to 9 hours (Participants of all levels are welcome)!! Money raised will help support Lancaster County adults with developmental disabilities. Jingle Bell Run/Walk® is a fun and festive way to kick off your holidays by helping others! Wear a holiday themed costume. Tie jingle bells to your shoelaces. Run or walk a 5 kilometer route with your team members and celebrate the season by giving. Healthy Holidays Program – For all PMSD employees! !